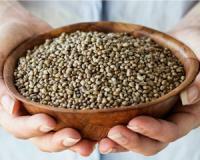 Hemp seeds – as well as hemp oil – are a top food to keep your cholesterol in check. These delicious, nutty-tasting seeds are an excellent source of essential fatty acids AKA healthy fat that your body doesn’t produce, so it’s important to consume foods that contain them. These fatty acids help decrease levels of unhealthy fats and prevent plaque build-up in your arteries. Coconut oil has gotten a lot of bad press in the past because it’s rich in saturated fats. But in recent years, scientists and doctors alike have changed their tune after discovering that a fat-free diet is actually very unhealthy. The saturated fat in coconut oil helps raise your good cholesterol levels while reducing the bad ones. What’s more, coconut oil is a remarkable fuel source to keep you feeling energised throughout the day! Walnuts are one of the most nutritious nuts on the planet! They’re packed with omega-3 fatty acids, which slow down the growth of plaque into your arteries and help boost your good cholesterol levels. Walnuts can also prevent blood clots that can cause strokes or heart attacks. Combining plant-based foods like the ones above with regular exercise is one of the easiest yet most effective ways to prevent cardiovascular disease.